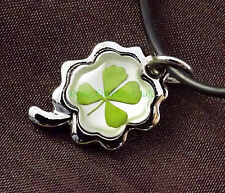 Real four leaf clover attached with clover metal frame cord 19" w/ ext. 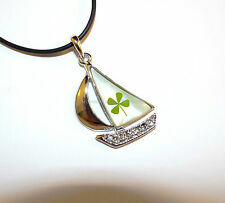 This beautiful pendant contains a real preserved four-leaf clover. Only one in 10,000 clovers has four leaves, making this unique and hard to duplicate. To preserve this beautiful plant, it has been carefully dried and sealed in acrylic, which will protect the clover perfectly. MADE WELL, IT MEASURES APPROX 16cm ACROSS THE FLORAL PART OF THE BIB. THE LARGEST FLOWER MEASURING APPROX 5.5cm IN DIAMETER, THE SMALLEST ROSE AT APPROX 3.5cm DIAMETER. Silver & Rose Gold Tone. Black Fabric Cord. Nickel Free. Multi Colour Fabric Circle Beads. Colours include Brown Blue,Lilac Navy, Purple. All strung on a multiple chain necklace with adjustable length. Bohemian Necklace. It carries a substantial weight at approx 68 gms. 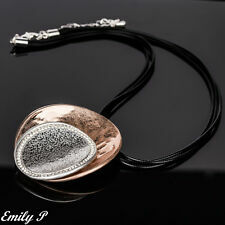 Sleek and stylish, this stunning necklace looks gorgeous with any outfit. We do not accept cheques or money orders from outside the United Kingdom. RRP £49.99. .the whole thing is just divine! A designer inspired bib necklace that features loads of black pearl beads sewn onto a thick soft fabric for comfort against the skin, that is then attached to a set of silver rhodium plated chains leading to a lobster clasp, adjustable fastener. The main pendant is the shape of afish. The fish shape has been cut from a rectangle piece and both pieces areattached to the necklace. 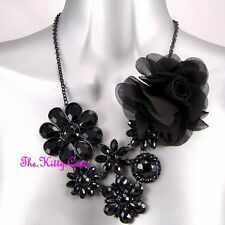 The necklace itself is made from lace and has aleather look although it isn’t leather and is vegan friendly.